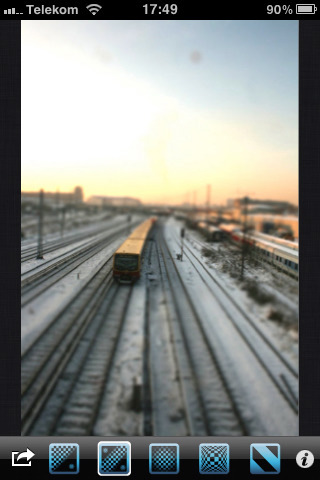 Tilt Shift Focus is a photography app that allows you to edit and enhance your pictures. It was developed by Sebastian Schenk and costs $0.99. You can use this app to morph your iPhone, iPod Touch, or iPad into a professional photography tool. Tilt-Shift miniature faking is the technique used in Tilt Shift Focus. The technique is generally used to manipulate a photograph of a life-size location or object to give the optical illusion of a photograph of a miniature scale model. Changing the focus of the picture simulates the shallow depth of field that you usually find with macro lenses, making the scene seem much smaller than it actually is. 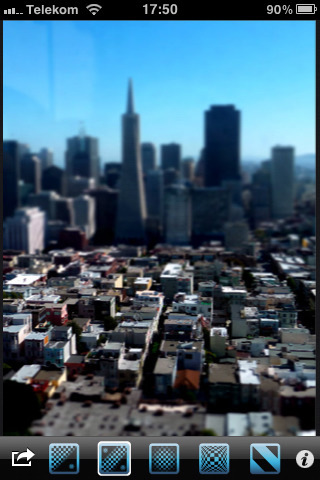 Along with focus manipulation, the tilt-shift photography effect is built upon by increasing color saturation and contrast, to imitate the bright paint often found on scale models. The technique is particularly effective on buildings, cars, and people. To use this app, you start by choosing a photo from your library or taking one using the app. Once you have chosen a picture, there are four different blurring tools that you can apply to it. The effects are as follows, linear, bi-linear, circular, and zoom. The difference between these tools is subtle; I cannot say that I have noticed anything remarkably distinct from one to the next. You can also use the Enhanced Contrast tool. You tap the button you want to use—from the five available—then you use the dots that pop up in the middle of the screen to pinpoint exactly where you want to edit the photo and the app applies the changes. When you are done editing you can save the picture to your photo library. The app comes with an in-depth tutorial to walk you through the steps. You cannot access Facebook or Twitter from within the app but you can upload any of the pictures you have modified and saved from within your photo library. Tilt Shift Focus is a great way to utilize the camera on your device to its full potential. This is definitely a valuable addition to the collection of photo enhancing apps I already own. AppSafari review of Tilt Shift Focus was written by Vanessa Paszterko on November 17th, 2010 and categorized under App Store, Art, Photos. Page viewed 3930 times, 1 so far today. Need help on using these apps? Please read the Help Page.